Hanoi (VNA) – ASEAN foreign ministers on August 5 reached a consensus on a draft framework for a code of conduct (COC) of parties in the East Sea. The draft is expected to be submitted to the ASEAN-China Foreign Ministers’ Meeting for approval one day later. 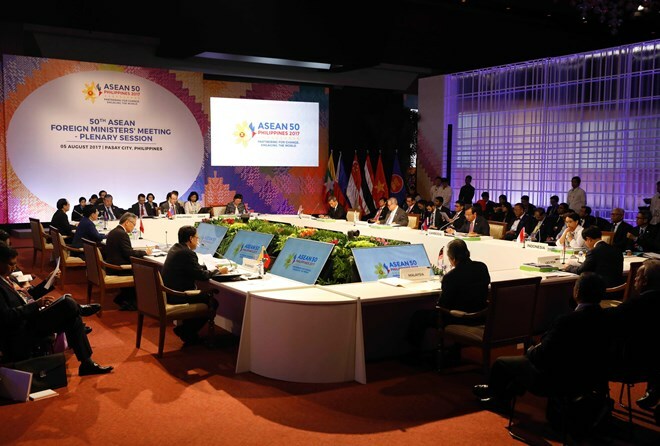 Robespierre Bolivar, acting spokesperson of the Philippine Foreign Affairs Department, said on the first working day of the 50th ASEAN Foreign Ministers’ Meeting (AMM 50) in Manila, the ASEAN ministers endorsed the COC framework for eventual adoption on August 6. This document will help ASEAN and China move forward to negotiating an effective COC, he added. The foreign ministers of ASEAN and 17 dialogue partners will meet on August 7 at the ASEAN Regional Forum – an important multilateral security dialogue to discuss hot issues in the region.